This article is part of the Things We Like series. Click here to find out more about Things We Like. Over the years, we've bought various bed sheets, but found ourselves using the same set over and over - Wamsutta Comfort Soft cotton sheet set, 400-thread count. We like it the best given its soft, smooth, and silky hand and because it stands up to repeated washing with minimal shrinkage and fading. We used to think bed sheets are all about thread count, that low count sheets would be coarse and uncomfortable and high count sheets would be luxurious and decadent. Having purchased sheets all across the spectrum (from 200-count K-Mart sheets to 1000-count "hotel" sheets), we have come to the conclusion that although generally speaking higher thread count indicates higher quality, the best sheets in terms of quality + comfort (we like soft and smooth sheets) do not necessarily have the highest thread count. Thread count is a measurement of the number of threads in an inch. This means a higher thread count has a finer (less coarse) weave. Below 300-count, this is easy to see - when you hold the fabric up to a light, you can see between the threads. Higher than 300-count, the fabric is dense enough that you usually cannot see through it. The 1000-count sheet we had was so dense that it felt almost like a solid piece (not woven) and if tented could hold its own weight up. Although very high quality, this sheet wasn't as soft as we liked. The type of cotton also makes a difference. We've found Egyptian cotton to be softer than Supima, and both to be softer than other cottons. The Wamsutta Comfort Soft sheet set is made of extra fine Egyptian cotton, and feels softer, silkier, and lighter than the 600 thread-count supima cotton sheet set we have. Another factor that is important in sheets is how well they stand up to washing and drying. One 300-count sheet set we bought felt soft and smooth coming out of the packaging, however after the first wash they became rough and uncomfortable. It seemed that the fabric was treated with something to give it a initial soft touch, but once laundered its true inferior nature was revealed. Excessive shrinkage has also been a common problem with many of the sheets we had, as well as fading. Luckily we have not had these problems with the Wamsutta Comfort Soft sheet set, which we've used for about a year and wash and dry weekly. Being lighter (less dense), they take up less space in the washer and dries more quickly than the 600-1000 thread count sheets we have. They also have a nice subtle sheen and billows out and settles slowly (like a parachute settling) when tossed up to cover the bed. The Wamsutta Comfort Soft Cotton Sheet Set can be purchased from Bed Bath and Beyond, and Amazon.com. They come in five colors: white, egg shell, mint (light green), truffle (dark brown), and wind (light blue). Queen size sheet set costs $90 and King set costs $100. It is more expensive than a lot of sheet sets on the market, but given the quality and unsurpassed comfort, this could be the only sheet set you need to buy in a long time. Very nice. I am sorry I don't recall the source, but I did read a few years ago that sometimes manufacturers manipulate the way they report thread count. They may do this by counting each separate strand in a twisted thread as an individual thread for the same of the thread/sq.inch count. We are planning a new bed in a year or 2, perhaps I'll add a set of these sheets to finish it off. I've slept on some fantastic 210TC sheets, and slept on horrible 1000TC and 800TC sheets. It really is all in the cotton! Not only that, but usually once you get over a few hundred, you usually end up with a sateen weave. A "percale" is an over-under-over-under weave, where a sateen is a under-over-skipping-seven-under-over-skipping-seven-under. While this gives the bedding more of a luster or a sheen, they can end up much much more fragile and likely to get snags or pulls (especially in an old washer which could have a small burr in the drum) and pill of they are not eashed and dried very delicately. One thing that people have a hard time with, too, is 100% cotton sheets and the fact that they don't come out of the drier as smooth as a cotton poly blend. *rolls his eyes* I know, right? Tip: Make sure you do NOT use fabric softener! Softener coats the fibers with an oil/wax which, while making it feel softer and reduced static, coat the fibers and make them less absorbent, which means they they don't wick moisture away from your body, and will make you much less comfortable! I purchased from Bed Bath & Beyond Wamsutta 6 sets of 1000 count sheets about 5 months ago in different sizes. I found that ONE set was VERY different. I looked at where they had been manufactured. The wonderful, extremely soft were made in INDIA. The poorer and less soft were made in China. Wamsutta moved their fatory to China from India. On the package, it will say India, however, in looking at the sheets and pillow cases, they say China, which is critical. The sheets made in India and STATES only on the sheeets and pillow cases, are the ones to purchase. Does anyone know WHERE I can buy these sheets. ON THE SHEETS, not the pkg. it will say INDIA. I need whatever you can find, up to California King. Green Stripe, Caki, Cream, Brown, whatever. I don't know where to find sheets made in a particular country - my guess if you'll have to try your luck at various stores. For the record, our Wamsutta Comfort Soft Cotton Sheets are made in Pakistan. I used to have a set of Wamsutta sheets that I absolutely loved, and I think these might be them. I've tried some others and have had trouble with them not being as soft, or if soft, as in a set of sateen sheets I got, really picking up any stray lint or pet hair that comes close to it. This is not a static thing. Anyone who has pets knows that some fabrics seem to just grab hair, even if treated for static. I think after my research, that some of it may be the length of the fiber, Egyptian being one of the longest. Any thoughts or observations? Thanks! You still want to have a decent thread count. There's no sense in having the best threads around if you don't have enough of them. Just ask Homer Simpsons hair! I need to purchase king size cotton fitted bottom sheets, approx. 15" deep. 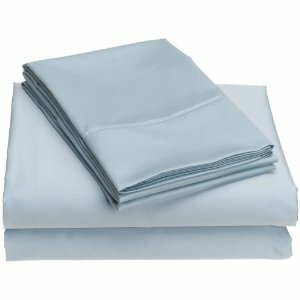 I have plenty of top sheets but the bottom sheets wear out and need to be replaced. Can you help me out? Also, I would like to receive a catalog if you have any available. Thank you very much.